Sprouting end cut, left, and growing celery on the right. When you slice off the big end of a large bunch of celery, don’t throw it away. (The correct name for the whole bunch is the head or stalk. The individual pieces are ribs.) In the springtime, you can plant the end pieces outside in your garden and let them grow. But what can you do in winter? 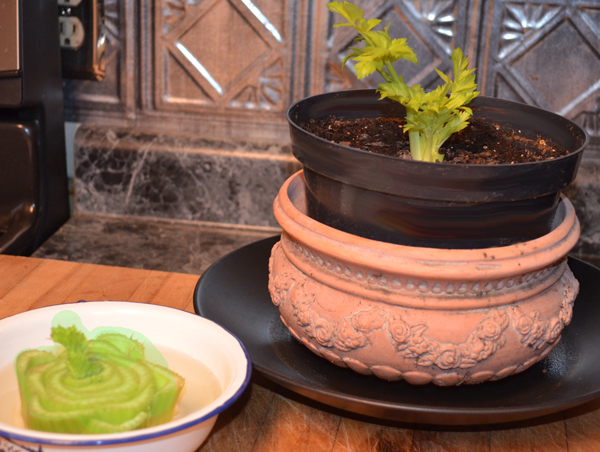 Take the clean end piece of celery and set it cut-side-up in a shallow dish with about one inch of water in it. Let it sit there for several days (up to a week) until you see a sprout coming out of it. Then plant it sprout-side-up in a medium-sized pot using ordinary household potting soil. See photo. In days your celery will be growing like gangbusters. Don’t be afraid to clip and snip for salads, use as garnish, and in soups. It will recover and continue to produce. You can have as many as you need waiting on your window sill. This entry was posted in Cooking Light, recipes and tagged celery, container gardening, kitchen projects. Bookmark the permalink.